Battle of Prestonpans - the Riggonhead Night March by Andrew Hillhouse. On the eve of battle, the Jacobite army secretly moves to take up position to the east of the assembled government forces in preparation for a surprise attack timed for dawn. On 17 September, the very day that Charles Edward Stuart was entering Edinburgh in triumph, Cope began to disembark his army at Dunbar, hardly twenty-five miles away. Had Cope arrived forty-eight hours earlier, history would have taken a different course, as Charles would have been forced to besiege a city already garrisoned by a substantial army. However, it took Cope a full day to land all his artillery, troops and supplies, before moving towards Edinburgh on 19 September to confront the Prince's army. Cope had 2,500 troops at the most (including the dragoons who had abandoned Edinburgh so precipitately a few days earlier). His army spent the night camped out at Haddington, before heading for Musselburgh. 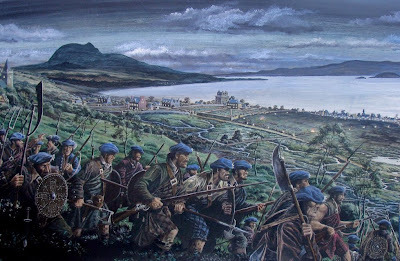 Cope had only reached the village of Preston, just west of Seton House, when he heard that the Prince's army was advancing against him from Edinburgh. He decided to halt, drawing up his troops in battle order to await events. According to some accounts, his army initially faced west, expecting the Jacobites to attack from the direction of Edinburgh. But, when the Prince's army came into view over the higher ground to the south, Cope's lines had to perform a complicated manoeuvre to turn to face south with their backs to the Firth of Forth. Even so, their position seemed impregnable, given the wide area of flat ground they were occupying. As Cope later wrote: `There is not in the whole of the ground between Edinburgh and Dunbar a better spot for both foot and horse to act upon.' He faced the Prince across a broad stretch of flat and marshy ground, crossed by ditches and walls. As John O'Sullivan said, `this was not a proper situation for Highlanders for they must have nothing before them that can hinder them to run upon the enemy'. Moreover, Cope's left flank was protected by `two large ponds and a morass' and his right flank by the high walls of the gardens around Preston House. In the days after Charles's triumphal entry into Edinburgh, reinforcements had reached his army, including 250 men from Atholl under John Murray, Lord Nairne, among them Menzies and Robertsons. Lachlan MacLachlan of MacLachlan also arrived with 150 clansmen from Cowal, having evaded the Hanoverian forces of the Duke of Argyll, and they were followed by 100 Grants of Glenmoriston. However, the Prince's army badly needed equipment as well as men, so 1,000 tents, 2,000 targes, 6,000 pairs of shoes and 6,000 canteens for cooking were ordered from the merchants of Edinburgh under pain of military execution. Arms were another priority and 1,200 weapons were found in a thorough search of the city, along with some ammunition. After two nights in the King's Park, the army itself moved camp on 19 September to the village of Duddingston, just south of Arthur's Seat, leaving a detachment behind to guard Holyrood House. That evening, the Prince was told that Cope's army was at Haddington and he immediately hurried from Holyrood House to Duddingston, where he found his commanders squabbling over who should have the position of greatest honour on the army's right wing. The MacDonalds claimed it as theirs by right because they had occupied it ever since the Battle of Bannockburn. However, after drawing lots, the MacDonalds of Glengarry, Clanranald and Keppoch found themselves placed on the left wing, with the Camerons and the Stewarts of Appin to the right. The argument was only settled when Lochiel agreed to relinquish the right wing position to the MacDonalds if there was no action next day. We spent the afternoon in reconnoitring his position; and the more we examined it, the more our uneasiness and chagrin increased, as we saw no possibility of attacking it, without exposing ourselves to be cut to pieces in the most disgraceful manner. Faced with this impasse, further quarrels broke out among the Jacobite commanders and especially between Lord George Murray and John O'Sullivan. Anxious that Cope's army might move off towards Edinburgh to avoid engagement, the Prince gave an order to O'Sullivan that the Atholl Brigade should guard the road to Musselburgh, west of Preston House. Lord George Murray was furious when he discovered what had happened to his men and they were recalled. Even so, the abortive manoeuvre had the effect of unsettling Cope, who apparently now thought himself threatened by a two-pronged attack from the south and the west. Yet, when the attack materialised early next morning, it came from the direction that Cope least expected - the east.